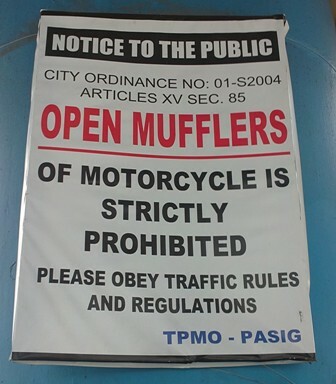 This is a copy from http://bikerpinoy.blogspot.com/. 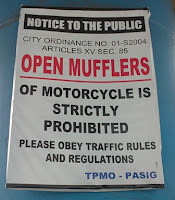 Let’s spread the news bikers. This creates a very vague picture of the law and is prone to subjective apprehensions. Each enforcer interprets the law in such a way that he does not even know the difference between an aftermarket pipe and open pipe. And needless to say, how can you prohibit something that is openly sold in the market and punish the end users unnecessarily? If something readily available to the consumers are being sold is outlawed, should we take this off the market first before we regulate the end users? And should all vehicles be included as we see this not only on Motorcycles but on other vehicles as well? I write this to clear out the issue and to prevent the community from escalating this issue any further. If there is anything that our two organizations can do to assist the city in clearing out this ordinance or perhaps, making it more understandable and acceptable to the riding public, please do not hesitate in reaching us. If it is also possible that we request for an audience to be able to talk to your principals so that we can discuss this matter.